William McDonough wants people and businesses to start thinking in a whole different way about how and why we do things. Instead of thinking only about limitations and how to minimize the damage we do to our ecosystems and our planet as a whole, he suggests we stand that thinking on its head. Why not also start with the concept that it is possible to create abundance? Why not start with intention, and principles? And why not design not just with the end in mind, but also with endless resourcefulness in mind? 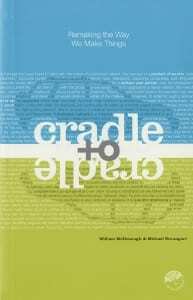 McDonough and Michael Braungart wrote the highly influential book Cradle to Cradle: Remaking the Way We Make Things in 2002, discussing new ways to think about the way we design and manufacture products, and how we behave in the material world. Three of the key elements of that work were the notions that design is the first signal of human intention, the notion that being less bad is still being bad – just less so – and the drawing of a distinction between materials in the biological and technical nutrient cycles. Regarding materials, most of us have a pretty good idea of how the biological nutrient cycles work: animals and trees grow, die, rot, and form the essential elements for the next generation of food and trees. Nothing is wasted. The technical nutrient cycle could work the same way, if we were smart and committed enough to design it to do so. Technical nutrients are man-made materials, which – if treated properly – could become the ‘food’ for the next product. They could in theory be reused indefinitely. In some cases, this cycle occurs to some degree today. An aluminum can gets thrown into a recycling bin, collected, melted down, and reused to make another aluminum product. In the process, one doesn’t need to mine, ship, and smelt more bauxite into aluminum. And 95% of the energy is saved relative to making a new can. Simple and logical, right? We can do better than that, McDonough and Braungart proclaim, and they have recently released a new book, The Upcycle: Beyond Sustainability–Designing for Abundance, to further illuminate the thinking and highlight successful examples of good design put into practice. I recently had the good fortune to get an hour of McDonough’s time to delve further into the topic. 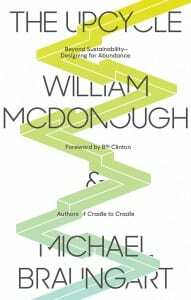 If you’ve read either of William McDonough’s books or his Hannover Principles – Design for Sustainability (1992), you will realize he is a big picture thinker. But as an architect, he’s also a practitioner of details. So our conversation took us from supertankers, steamships, and the Aeolian kinetic to the beauty of plastic, to the nuts and bolts of how you design a really good chair, and how you design and construct a building that uses little and gives back clean energy to the world. Design and intention, says McDonough, is the key to the whole thing. We’ve been designing our way into trouble for quite some time, and it’s going to take some turbulence to get us moving in the right direction. You could start with Emerson in 1831 when he went to Europe after his wife died…Just for effect you can imagine he goes over on a craft made from recyclable materials…powered by the Aeolian kinetic…He returns in a steel rust bucket with smoke in the sky and oil in the water, operated by people shoveling fossil fuels in the mouths of the boilers in the darkness. If you think about those two things, we realize that design matters, because this is design…If we jump ahead to the supertanker, we realize these metaphors get really interesting. Who is the leader of this ship? Well, it would be the designer of the ship because if it is not seaworthy it’s going down in a storm… Then you say, how do you turn a supertanker? Well, as Buckminster Fuller famously pointed out, you use the trim tab, which is the little rudder on the rudder…That’s a lot of inertia and momentum in a supertanker that is underway and it takes miles to stop and miles to turnaround. So to expand on the metaphor, the trim tab – the little rudder – points you the way you want to go, and that turns the big rudder in the opposite way you want to go, and that creates turbulence…This turbulence behind the tanker is immense amounts of energy being torn asunder, and then the big thing starts to move in the direction the little thing pointed. Today, let’s talk about how we navigate into the future, and how do we see our path clear? The compass could be in looking at how this all works in the natural world. Life, McDonough points out, upcycles. That is, it creates abundance through its series of interlocking processes. Society and commerce need to do that as well. We need to do it by focusing on how to create abundance rather than simply thinking about how to be less bad. And we need to do it by putting the right materials in the right place. Polyester and plastics are great – if they stay as plastics. The point of this all is to utilize the material in its present incarnation for whatever product it supports. We call it product to service – the service of metal (or any material) in this use. What you get is the service of this plastic the service of this metal, in this use. What we want is reuse and at the highest level. For example, the steel could be used in a chair in this incarnation, and as part of a toy in the next. Polyester could be re-used now that we know how to reuse polyesters after they have been shredded. Done this way, nothing gets thrown away. Commodities do not become scarce. They simply get re-used. But this won’t happen overnight, and it involves a change in our thinking. McDonough acknowledges that the mere fact of recycling is a good beginning but most things get “downcycled” and are constantly losing quality. Materials may get “efficiently” reused and “waste” avoided but it quickly becomes clear that most of our products and packaging were never designed to be recycled. But upcycling is even better. That would be when your processes and activities actually make the world better than it was before. For example, you remove antimony from food grade plastics to make them even safer, or manufacture in a way so that water that comes out of a plant even cleaner than when it went in. You don’t melt food grade plastic and downcycle it into a park bench. You don’t turn food grade plastic into fleeces. You create food grade plastic that is non-toxic and can be reused – as food grade plastic. We do not have an energy problem. That is a huge misunderstanding. We have a material problem. We have carbon as – a material – in the atmosphere. And material in the wrong place is a problem. He draws the analogy with lead in gasoline. Do you think society would allow people to pour lead all over our highways and our watercourse like we used to? It took thirteen years to get lead out of our gasoline once science and society realized how dangerous it was…Did we really intend to give our children brain damage? And once we knew, did we really intend to perpetuate that? Isn’t that known as negligence? When you know better, do you do it anyway? Really, is that our plan? At what point do we declare carbon a toxin in the atmosphere? Carbon is a marvel. It’s the basis of life. We love carbon, we are carbon, but we put it in the wrong place. And so, McDonough has recently been floating his idea of using railway and highway rights of way to build linear solar farms or linear windfarms in the Great Plains. He believes the sides of our national highway system could be used in the same way. He acknowledges the obvious reality of the difficulties on the ground, but his point is that you have to start somewhere. Read the full William McDonough interview on Forbes.com.